a pretzel crust! Photo courtesy Bonefish Grill. Beyond panko: Turn pretzels into a tasty crust for seared fish. 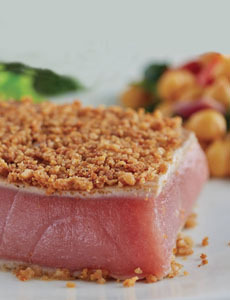 We love the appeal of this seared tuna recipe from Bonefish Grill. Not only do we love tuna; but the pretzels offer a fun alternative to the sesame crusted tuna recipe we typically use. The recipe can be used with any thick fish fillet or steak. It is easiest to crush pretzel sticks; thin and uniform, they crush quickly and evenly. But you can use any pretzel. We also tried the gluten-free Pretzel Crisps we had on hand, and whole wheat pretzels from Snyder’s Of Hanover (which also makes GF pretzel sticks). Our favorite crust was made from Utz sesame pretzels. But we think our choice going forward will be to add some toasted sesame seeds to whole wheat pretzels. Don’t add much salt to the red wine sauce, unless you’re using salt-free pretzels. Otherwise, there’s plenty of salt in the pretzel crust. Check out the history of pretzels, below. Without prayers and kids, we wouldn’t have them. 1. Pulse the pretzels in a food processor to the consistency of bread crumbs. Set aside. 2. MAKE the sauce: Mince the shallot and heat the butter in a skillet over medium heat. Add the shallots and sauté until soft. Then add the wine and deglaze the pan. Simmer the sauce for three minutes so the alcohol evaporates and the sauce thickens. 3. HEAT a cast iron skillet over high heat and add the butter or oil. Press the tops of the tuna steaks into the pretzel crumbs to coat. When the fat starts to smoke, place the fish face down in the pan. 4. COOK for 4-5 minutes top down, then flip over and cook for another 3 minutes to serve rare, as they do at Bonefish Grill. 5. SERVE with the sauce on the side, so the crumbs stay crisper. Why the two different side shapes? Dough for the original pretzels, called pretiola, were twisted to resemble a child’s arms folded in prayer. Photo courtesy Williams Sonoma. 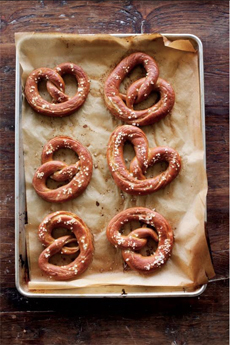 Here’s a recipe to bake your own homemade soft pretzels. If both pans are the same size, the frying/sauté pan will have a slightly larger surface area. In a 12-inch diameter pan, it can make the difference when fitting in pieces of chicken or other food, so you can cook everything in one batch. The other benefits of a frying/sauté pan: Liquids are less likely to splash out of the higher, straight sides; and lids fit more tightly, limiting evaporation. Chefs prefer the sloping sides of a skillet for quick cooking techniques like stir-frying, where the ingredients need to be moved around continuously. A skillet is also a better option for a frittata, served straight from the pan. It is a fun fact in cooking that a skillet is better for sautéeing than a sauté pan. The sloping sides make it easier to move pieces of food around while constantly stirring, and to more easily shake the pan to toss the food for even cooking. For the best sear, choose a cast iron skillet. It gets hotter than other metals. You can, of course, sauté your food in a straight-sided sauté pan, but it requires more work: constant stirring and turning. Before the introduction of the kitchen stove in the mid-19th century, a commonly used cast iron cooking pan called a spider had a handle and three legs used to stand up in the coals and ashes of the fire. Cooking pots and pans with legless, flat bottoms were designed when cooking stoves became popular; this period of the late 19th century saw the introduction of the flat cast iron skillet. Finally, mention must be made of the grill pan. It’s a frying pan with very low sides and series of parallel ridges on the cooking surface, which both enables cooking with radiant heat like a grill, and allows the fat to drain down. It was all for the kids. In 610 C.E., monks in the what is today southern France northern Italy twisted and baked scraps of dough as a reward for children who had memorized their Bible verses and prayers. The word evolved into the Italian “brachiola,” which means “little arms.” Over the next few centuries, the pretiola journeyed through the French and Italian wine regions, crossed the Alps, traveled through Austria and arrived in Germany, where it became known as the Bretzel or Pretzel. Here’s more of pretzel history.